Once again I have been blessed to play music with a amazing group of musicians. Sunday September 22nd was Be-Bop-a-Reno at D’Anbino!! From Left to Right; DG, John D’Andrea-Saxophone (Emmy Winning Composer “Dirty Dancing” “Baywatch” and Arranger/Producer of 25 Gold and Platinum Records), George Young-Saxophone & Flutes (George Benson, Mick Jagger, Pavarotti, John Lennon, Frank Sinatra, Saturday Night Live Band and a host of feature films), Ken Hustad-Bass (San Luis Obispo Symphony, College Music Professor) and (seated) Charlie Shoemake-Piano (George Shearing, Quincy Jones, Legendary Jazz Educator). 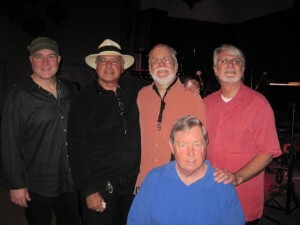 My heartfelt thanks to John D’Andrea for inviting me to play with this wonderful group. Look for the video from this performance coming soon!